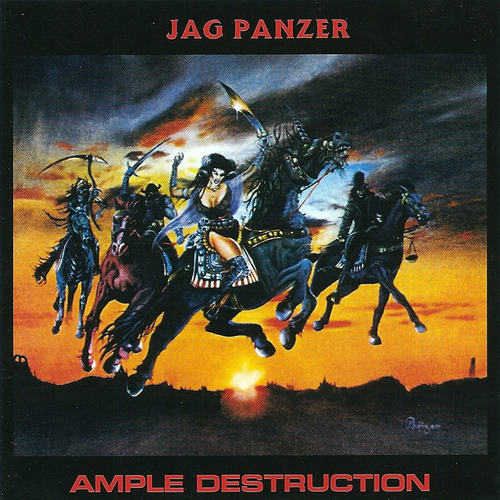 Coming from U.S., Jag Panzer was formed in 1981, under the name Tyrant and due to legal problems later that year they chose the name they come by until today. Though they recorded just one album during the 80’s (the legendary “Ample Destruction”) still, they made a myth around their name. They released a couple of demos, which preserved (and probably enhanced) that myth, the first one in 1985 and the second in 1986, before their 1987 -brief, luckily- break up. In 1993 they reunited and released a totally bad album named “Dissident Alliance” (1994), very far from their personal style, with which they stayed in the collective memory of the power and traditional metal fans. Since 1997, however, they restored their fame by releasing 8 albums and disposing the memory of “Dissident Alliance” behind them. Some of them, that came after the 1997 albums, will be presented in this column in the future… probably all of them…! A year after the release of their debut EP “Tyrants”, Azra/Iron Works rapidly cut their first full-length album. It is funny that one of the main composers of the album had joined the band just in time. So, guitar god Joey Tafolla completed the original line up of Mark Briody (guitars), John Tetley (bass), Rick Hilyard (drums) and Harry Conklin (vocals), just before the recordings of “Ample Destruction”. Jag Panzer found Joey in the classified section of musicians looking for bands in Orange County, California. The band that lived in California was looking for a second guitarist and Joey drove up from Orange County and auditioned. The rest is History. Even though songs like ‘License To Kill’, ‘Symphony Of Terror’ and ‘Generally Hostile’ were already half-written before the arrival of Tafolla, Joey brought a bunch of new ideas (with ‘Warfare’ and ‘Harder Than Steel’ being among the first songs they wrote with Briody in California), while his guitar skills expanded the writing approach of the rest of the band. After moving to Colorado, Tafolla’s influences of Rainbow and Ritchie Blackmore brought the characteristic guitar harmonies of Jag Panzer and everyone understood that the studio album was at least one level higher comparing to the EP. Jag Panzer sounded more mature, with way better instrumentation and all 9 songs were re-written from start at John’s parents’ house back in Colorado and it were actually brand new compositions (except ‘The Crucifix’ which the band had been working on before along with the demos). “Ample Destruction” (and Jag Panzer’s sound generally) is based on the melodic riffs written by Mark Briody and Joey Taffolla reminding us of Maiden and early Fates Warning, with the difference that theirs are sharper and are using more distortion, and Harry “The Tyrant” Conklin’s outstanding voice. The songs have simple structure, and, in many occasions, they are deliberately based on power chords, which amplify Harry Conklin’s distinctive voice, which does not need backing up from the music, especially when he makes the fan-loved falseto voices. The changes in rhythm enrich the sound, resembling at times marching music, mainly in the drumming. All 9 songs are top notch. ‘Generally Hostile’, ‘Reign of The Tyrants’, ‘Warfare!’ and of course ‘Licensed to Kill’ stand out.